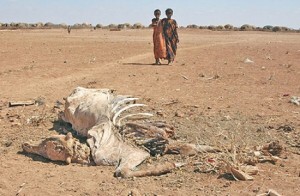 As you know, East Africa is in the grip of a horrible drought. We have all seen images of the hungry and malnourished arriving in refugee camps, many after walking for weeks or months, surviving not only the bleak landscape but also bandits and even wild animals. The perseverance of these people, of mothers sacrificing to save their children, is a tribute to the human spirit. This is personal for me. I worked in this region in similar crises going back to the 1970s. Just before becoming CRS’ president in 1993, I was in Kenya as we helped Somalis who suffered through a drought made worse by political conditions. And now here we are again. As before, we are responding to this great need. In the Dadaab refugee camps in Kenya, where tens of thousands of distressed Somalis have trekked for food and safety, hygiene supplies are on their way to assist some of the many hundreds who arrive every day. CRS will take an active role in the expansion of the camps to serve the burgeoning population that now numbers in the hundreds of thousands. We are also helping Kenyan residents who live near the camps, who are feeling the stresses brought by the drought and by the multitude of refugees. If there is one thing that this crisis proves, it is that, while drought is an act of nature, in this day and age, famine is made by people. Unrest in Somalia has severely limited the work of humanitarian groups like CRS. With our partners, we have worked for years to get as much aid as we can directly to Somalis. All of us must work and pray together for the recovery of Somalia. But even as you help us aid those stricken by drought, I want you to know that you have been helping many more families come through this difficult time healthy and safe. After past food crises in Ethiopia, a coalition of aid groups, led by CRS, put in place a system to get food to those who find themselves in need. Working with the government of Ethiopia, this coalition has more than doubled the number of Ethiopians receiving food, to over a million, in response to this drought. Moreover, there are many Ethiopians and Kenyans who need little or no food aid during this drought. Over the years CRS has worked with communities to drill wells, sometimes 1,000 feet deep. We have helped develop irrigation projects and build reservoirs and other water retention systems. We have worked with farmers who are now planting crops that do better when rainfall is erratic. This is work that is over and above our response to the emergency. Frankly, it is not work that gets you on television. But it is work that not just saves lives, it enriches lives. It allows families to plan for the future. It allows children to grow up healthy and strong. It brings hope to people who have known too much fear and uncertainty. Through CRS, you have been working in Ethiopia and Kenya for decades. And when this crisis is over and the reporters and photographers and cameramen have left, you will still be there. Our goal for the next drought in East Africa is that the journalists will not return because there will be no story: people will be coping despite the hardships. It is not a goal we are going to realize any time soon, but it is a worthy one. It is because of you that we can strive to make it happen.